Speaking from experience, there are few things quite as frustrating as when an opponent wastes a bunch of time casting mana artifacts on their first few turns . . . and goes on to win the game anyway, because you either drew poorly or the creatures in your colors aren’t quite fast enough to punish them (thanks a lot, Kamigawa-Ravnica Standard). That should never happen again in any format where Treasure Nabber is around, although I do wonder what the right way to build around him is: do you put a bunch of high-cost cards in your deck, in anticipation of all the Sol Rings and Coalition Relics you’ll be stealing, and just accept the risk that you’ll occasionally have hands where you draw all of them and not Treasure Nabber? Personally, I would look into combining him with Atog, but that might be too mean for some people’s taste! Also, I’m a little curious about what he might do in Vintage, where Moxen are legal and you could theoretically make your own Mox/Lotus/Aether Vial-powered goblin deck. Considering that Sol Ring is a staple in Commander, being able to misappropriate all of the Sol Rings, even temporarily, is a good thing. And it’s not just Sol Rings that are fair game, as any artifact that’s used for a mana ability gets absconded with. If you have enough people running around in a game, Treasure Nabber can enable a massive turn just like that. While mana rocks are a Commander staple, they’re mostly less useful in other formats…with one potential exception in Vintage, a format dominated by Moxen and other degenerate trinkets. 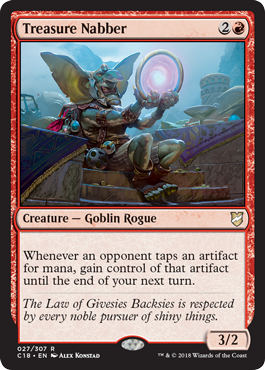 Treasure Nabber do weird things with shinier things, though I suspect that’s more flight of fancy, particularly with the goblin being in what might be the weakest color in Vintage. It’s also a 3/2 Goblin, which enables Goblin shenanigans, I suppose!